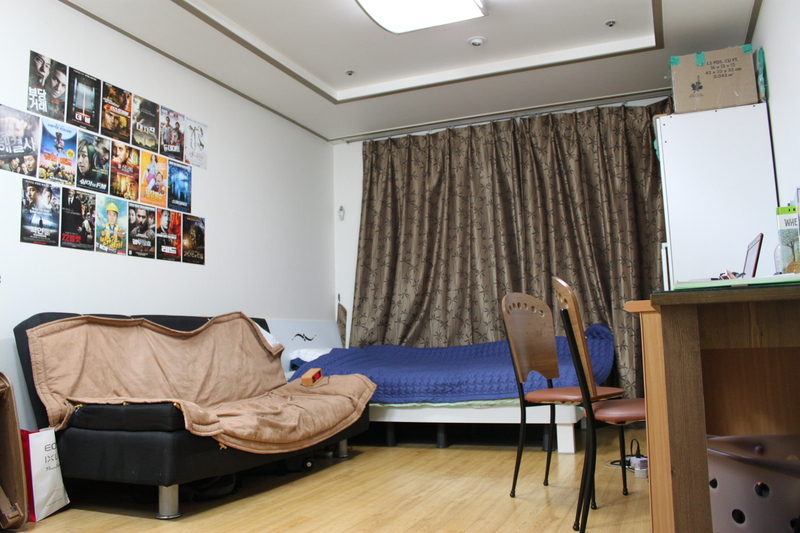 I remember the day when my main co-teacher showed me my Korean apartment. I was carrying two suitcases and was swaddled in a sopping-wet sweater vest, slick with Korean humidity and my own terror-sweat. I looked around my one room, my first apartment to myself, and was stunned by a sense of grandeur. There were walls and a ceiling, a bed and a couch, pots and pans and an entire bathroom, and they were just for me. They were mine. All twenty cubic metres of them. My meagre collection of belongings easily slid under beds and into cupboards, my suitcases wedged below the couch and beside the wardrobe. I had no decorations to speak of, other than pictures I sellotaped to walls and whatever sea-creature decals I allowed to remain spread across the apartment in monument to its previous occupant. I was a grown-up, and this was minimalist living, I thought. The lack of space necessitated the style, but it suited me fine. Extra room just meant more things to clean, more things to polish, more things to worry about damaging or coating in ice cream when I grew careless and sloppy. A one-room was the apartment for me, as it necessarily created a simplistic lifestyle, near monasticism in its quiet, lazy effortlessness. I felt moved in within an evening, and as much as the place could become recognizably mine, as much as a single room with a kitchenette and a single bed can become personalized, it was shaped in my image. Photo is actually to scale. The moment I enter another friend’s apartment in Korea is usually a time of burning, roiling jealousy. The apartments my friends live in seem cavernous, nearly monstrous–hulking, beyond-spacious grand cathedrals. I look around at the enormous amount of free space, the storage, the kitchen counters, the presence of more than one room, and I think you could fit a whole family in there. An extended one, with lots of live-in uncles and aunts and in-laws and third cousins. Some of their friends and well-wishers, too. Maybe a few transients. And then I think of my apartment and I begin to plot this friend’s destruction. All clean on the western front. To redouble the difficulties of moving to a foreign country, the onslaught of my big dumb adventure in Korea coincided with the first time I lived away from home and the first real Big Boy job I had ever had. As though to compound and concrete up my developing, nascent sense of grown-upedness, I would move around the world on my own and begin working full-time all at once. The teaching, at least, I had done before. Moving to a different culture, I felt ready for, at least in-as-much as one can feel ready to abandon everything your brain accepts as a normal way of life. The weirdest part has probably been adjusting to living on my own. Korea and Me – a series of photo essays detailing the particulars of the waygook in Korea. These, really, are to show you the individual examples of the general truths for foreign English teachers. My apartment, my school, the neighbourhood, the typical restaurant… I will photograph them endlessly and then write a big slew of words telling you about them. It seems fitting I should start with the apartment.